"Dusty takes readers into the real west at full gallop." 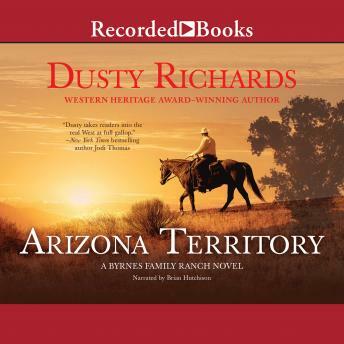 -New York Times bestselling author Jodi Thomas Western Heritage and Spur award-winning author Dusty Richards tells the thrilling saga of Chet Byrnes, a man who brought the spirit of Texas into Arizona Territory-and the guns to back it up. Have Gun, Will Battle Chet Byrnes has built a ranching empire from the ground up. And he's defended it with his sweat, blood and a ragtag band of ranch-hand fighters. Now a beautiful young Spanish widow comes into Chet's life, just as he starts off in search of a lost cattle drive. The search leads into the eye of a sprawling, violent storm. Chet, and his men-and his seductive new woman-end up on a wild ride through Nebraska, Colorado and Kansas, where authorities want to confiscate the beeves for trespassing. With Indians, outlaws and an oppressive government crossing their path, Chet is on a cowboy's honeymoon: fighting and shooting all the way back home.